This classic fountain highlights a dining terrace in the back garden of a historic residence. 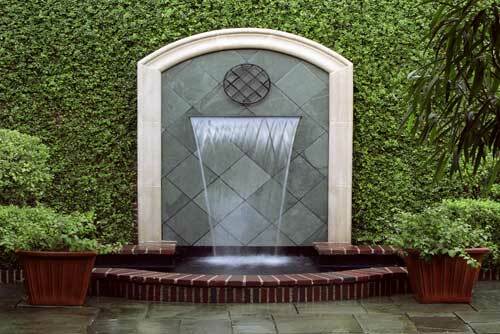 It is designed to provide a visual focal point while softening a large brick privacy wall and providing soothing water sounds. The limestone banding frames the sheer descent waterfall and accentuates the form against the green fig ivy. 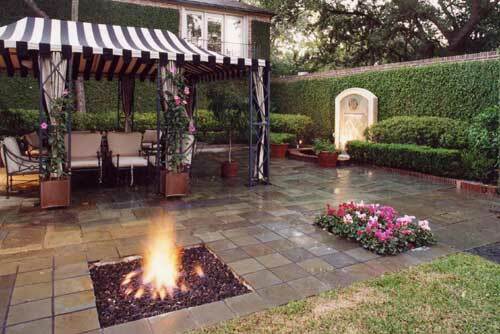 Monochromatic green slate adorns the field area with a diagonal pattern for added interest. A subtle arch in the raised basin repeats the banding form and features antique red brick matching the residence. Black plaster provides contrast and depth to the water and ties in with the finish of a circular ornamental grille. This elegant composition creates a style that is irresistible.